How do you put into words something that renders you speechless? You can’t explain your emotions or share your thoughts because it seems like there is nothing to say, but you feel like you should. I have been putting off writing this blog post for as long as possible for this exact reason. Within the first week of being in Senegal I experienced perhaps one of the most powerful moments in my life. I was brought to tears, and that NEVER happens. On Saturday, 9/10/11 I visited the slave castle on Goree Island, which from the 16th to the 19th century was one of the most powerful slave trade ports in the world. 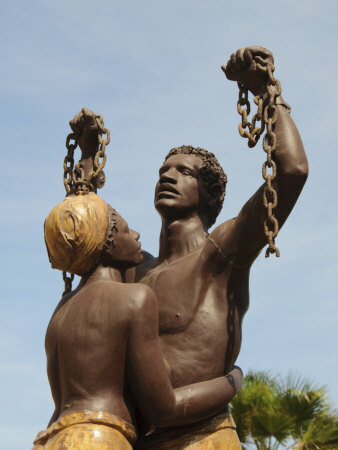 It is a constant reminder of this country’s tragic past in its role in the Atlantic slave trade. However, the place itself is a physical contradiction. Goree is breathtakingly beautiful, the people lively and vibrant, and the beach littered with carefree children. When we arrived on the island we were greeted by our tour guide, his name was Aliou.His voice lacked both emotion and conviction. He spoke of enormities with such ease and poise, as if he were reciting a script he had memorized and had reiterated it countless times. As we approached the castle we passed by a statue that symbolized the emancipation of the slaves. However I was too consumed with the smoldering heat to pay any attention. Finding shade to escape the smouldering heat seemed more important than listening to the guide’s description. I had learned all about slavery before in classes, books, movies, and documentaries. I figured that there was nothing that I hadn’t seen before or just knew from what I’d read and heard about. As we stood in the threshold of the castle I felt a complete shift in comfort. This wasn’t a picture in a book, a clip from a movie, or a figment of my imagination. This was a real place where millions of people were stripped of their humanity and subjected to horrific conditions. It may have been the very place where my ancestors came from, and here I was. We entered the men’s ward; It was a dreary cement existence no larger than a standard bedroom. It was said to hold at least 50 men at a time. As Aliou spoke about the horrendous conditions an air of discomfort consumed me, the coldness of his voice and the matter-of-fact-ness in his tone was not translating the severity of what he was describing. As my eyes began to wander I saw a window, more so a sliver of a rectangle cut into the wall that peers into the bushes. Its size was equivalent to the length of my arm and the width of my hands palm to palm. It was by far the most striking reality of the experience on the island. It represented helplessness and a broken spirit. To me the horrors of slavery were not just the physical aspects but also the psychological defamation that came with it. The window represented a longing for and reminder of freedom.To be able to see, feel, taste, and smell your greatest desire and know that it is simply impossible to attain, nothing else matters and the human spirit is broken.You are forced to except your reality. Next was the girls’ ward, we were told that the virginity of the girls was sold to Europeans that stayed in the guest houses upstairs and that the value of a female was appraised based on her ability to bear children. I gasped as he spoke and covered my mouth. I wasn’t shocked, just mortified as the question “What if that was me?” continuously rung in my head. In that moment I got this indescribable feeling that would stay with me for the rest of the day. It was a combination of disgust, anger, and disappointment that manifested itself physically as a feeling of anxiety and butterflies in my stomach. I immediately walked out of the room. As we moved towards “the door of no return” that feeling grew even greater inside me. I walked over to what looked like a miniature cave. It was about waist height, about 5 feet wide and maybe 7 feet deep. This was the punishment area for rebellious slaves. Sometimes more than 20 people were smashed in there with an iron gate. I leaned over and peered in. As I looked in I had a clear image of a hollow, decrepid man hunched over staring directly at me. I felt my eyes well up with tears and the next thing I knew I was hastily wiping my face before anyone else could see. It is hard for me to put into words why this image impacted me in such a strong way. It felt extremely personal, I came to realize that this was a part of me. I was able to connect the dots between what I was taught, my experience as a black woman, and what I witnessed on that day.